It is a clever trick if you can pull it off - mimic another, more dangerous animal and so avoid being eaten. Many insects try it, but it has been a long standing puzzle why some of the worst mimics in Nature can still seem to escape becoming a meal. Now, Canadian scientists tell Nature journal they can answer that one. Larger animals, they say, make for more substantial meals, and so their mimicry needs to be spot on. For small prey, a great performance is not so essential. "Mimicry of harmless species pretending to be dangerous ones in order to avoid being eaten is one of the best celebrated examples of the outcome of evolution by natural selection," says Professor Tom Sherratt, of Carleton University in Ottawa, who led the research. "Good examples of mimicry are highlighted in biology text books, but many mimics are poor and their emergence remains something of a puzzle." Mimicry is common among plants and animals. Species of snakes, spiders and butterflies have all evolved to look like other species to ward off predators. But one of the great mysteries in biology is that most of this copy-cat behaviour is not very good, and bad impersonators seem just as abundant as the good ones. A simplistic interpretation of Darwin's theory of natural selection would suggest that it would be better for all mimics to closely resemble the species they are trying to impersonate. One explanation for why some might not achieve this is the "eye of the beholder" theory. Listen to the sound of a wasp, followed by a hoverfly trying to sound like a wasp. Darwinian selection would suggest that over time, hoverflies that sounded most like wasps would be preferentially selected until a species emerged that sounded very nearly, if not exactly, like the creature it was trying to impersonate. In contrast, lineages that were poor mimics would all be eaten and die out. The new Canadian research suggests why this hasn't happened. This states that although the mimicking species aren't convincing to humans, they do fool their predators whose senses are quite different to ours. Darwinian selection would suggest that over time the hoverflies that sounded most like wasps would be preferentially selected until a species emerged that sounded very nearly, if not exactly, like the creature it was trying to impersonate. In contrast, the species that were poor mimics would all be eaten and die out. Another theory is that poor mimics are an amalgamation of unappetising species and so, although they don't resemble any one of them to a predator, they do represent the worst possible combination. To probe the conundrum further, researchers at Carleton University studied 81 different species of hoverfly, which to varying degrees mimic bees and wasps. Hoverflies are harmless flies and yet many have evolved a resemblance to wasps and bees to avoid being eaten by birds. Some species of hoverfly look very close to the bees and wasps they are supposed to resemble, and other species only bear a passing resemblance. The team began by quantifying how close each species was to the bee or wasp it was trying to impersonate. They did this by showing photographs to people and asking them to give each species a score out of 10. The team then combined these results with an objective score obtained by comparing measurements of the body parts of each species and their bee or wasp counterpart to obtain an overall score for similarity. 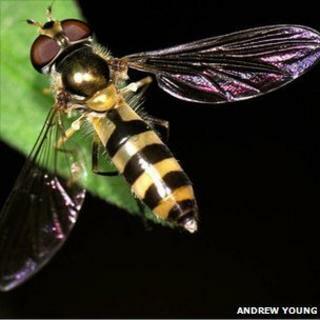 The scientists found that the larger the hoverfly species, the closer it resembled the emulated wasp or bee. They also found that the smaller species were not very good mimics at all. "If you are a small hoverfly then birds are not going to be very interested in you," Prof Sherratt explained. "You are a relatively unprofitable meal and so the selection on mimicry is relatively weak. "All you need to do is vaguely look like a wasp, and a bird will be sufficiently deterred to leave you alone because it's just not worth taking the risk if it turned you were a wasp because the benefit is that much smaller. "But if you are a nice fat juicy hoverfly, you are a substantial meal to a bird, and in those cases you might experience even stronger selection to resemble something like a wasp or bee and therefore gain protection from predators." Are modern humans still evolving?